No posed picture could be more perfect. The scenery, the lovely women, water lilies floating below a picturesque foot bridge. A photograph capturing a moment in time frozen for all eternity. For me a silent scene; for them a day filled with the sound of birds, fish splashing in the water and the company of family. I never knew my mother like this, this beautiful woman dressed to the tens. I never knew her as a lady of fashion, poised and stunning. But I do have the photos. We do have the glimpses of moments in which we had no part. Yet we can look at an old sepia photo and know the closeness of these women. They teased and laughed. They enjoyed nature. Another time and place is brought into the present and though I am not there, I appreciate the moment. My cousin Margaret and I had picked up corresponding with one another a few years ago, not long before she passed. She loved the pictures of my family and sharing old memories with me. She told me of a grandmother I didn’t know as well as a young couple who would be my parents. I wish I could have sat with her looking at Mom’s photo album. So many questions might be answered. Where was the picture taken? Were Mom and Dad married then? Oh, if only I had one more visit. We don’t think to take that time when we are with the older generation to ask the questions. The album sat on the shelf my entire lifetime. Did our parents taken it down often and reminisce? Did they know that some day we would care about the stories? I do care. I write. I see stories in most everything. Yet I hunger for the true story, the history behind the photos. Do I hold on to the past? Oh, yes. The present is much richer in doing so. I love my roots and know that they are not only mine. The stories in the photos belong to many. They are history. 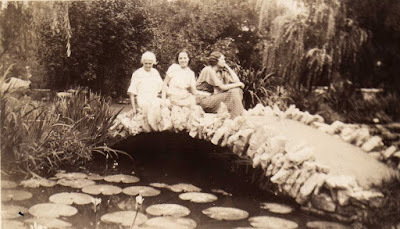 I would have liked to be sitting next to these three women on the footbridge dressed in a fashionable frock wearing cute shoes that are still in style today. You know, maybe I did today. Pam, catching up.....I assume one of the ladies on the footbridge is your mom, do you know who the others are and where is the footbridge. Beautiful picture! Love reading your blogs! 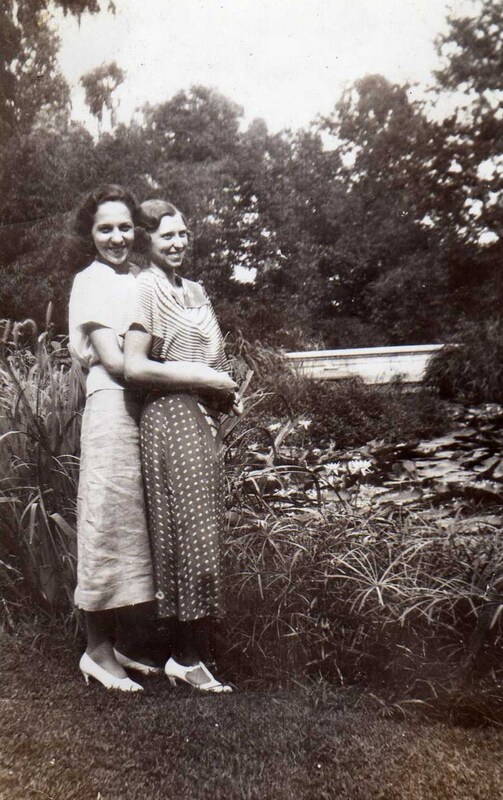 Janet, the older woman is Grandmother Loxley. Next to her is Margaret Yost. She was the daughter of Esther, Grandmother's sister who died when her youngest child was a baby. Mom is the beautiful woman on the end. Thanks, Janet. We share the history of Neff Road. You are writing the new one living on Neff Road. Do you know where the bridge was? Doubt if it is there anymore! Janet, my sisters thought it might be Greenville Park. If it is, they should have left it that way. What a lovely place, a lovely moment in time.